Turn off all the lights, close the curtains and wait a couple of minutes for your eyes to adjust to the darkness. Take your sellotape, and then quickly pull some off the reel, whilst watching it. You will probably have seen some little flashes of light as the take was unreavelling. 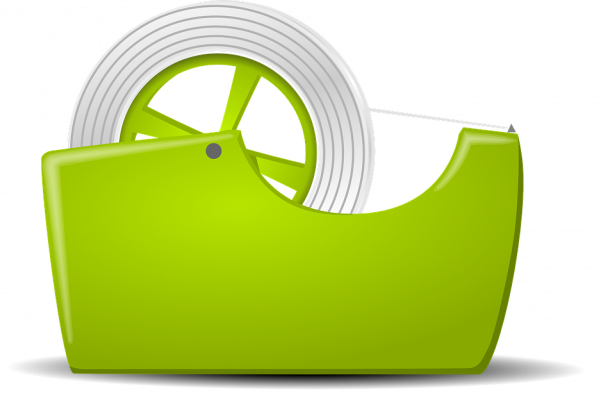 When you pull tape off a reel you are separating two materials, the polyester tape and the adhesive. This is very like rubbing a balloon on your hair, a charge is transferred. This means that the adhesive ends up positively charged and the tape left on the reel is negative. This electric charge is why when you pull tape off a reel it is attracted to your fingers and seemingly anything else it shouldn't be. As you pull the tape off the reel you are separating the tape and the adhesive. When you do this, the adhesive tends to get positively charged and the tape negative. As you pull the tape away you are pulling the positive charge away from the negative, you give the charge energy which is the same as putting it at a higher voltage. Some of the negative electrons will escape the tape and move through the air towards the positively charged adhesive. They transfer some energy to the air, which then releases it in the form of light which you can see. Eventually the voltage builds up enough for the charge to leak out through the air. As it moves through the air it transfers energy to air molecules and they glow, which you can see. However if this experiment is done in a vacuum there is nothing to slow down the electrons until they hit the adhesive. As they come to a shuddering halt they release energy in the form of x-rays. UCLA researcher Carlos Camara decided to try this experiment in a vacuum, and found that it released x-rays powerful enough to take an x-ray image of a hand.